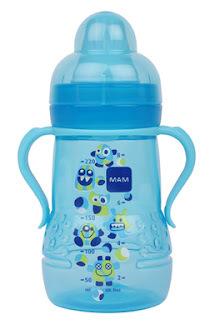 Flip Out Mama: MAM Pacifiers and Training Cups Review! Hurray! Okay ladies. Well, here's the part where I get real with you. The Bean is almost 15 months old. (On August 30.) And.. wait for it... he still takes a pacifier. *Hides head in shame*. I know, I know, I FREAKING KNOW. It's horrible. In my defense, he only takes it at naptime and bedtime, but he really has a hell of an attachment to the things. Several times during the day, he will go in and look in the crib for them, making sure they are still there. Weirdo. LOL. But anyways, the point... the point...!! Oh yeah.. the only pacifiers that Bean has ever taken have been MAM Pacifiers. They are just the best ones out there, in my opinion. Not only are they the cutest pacifiers out there, but they are all BPA Free and recommended by dentists. That makes me feel a little better about him still having them. 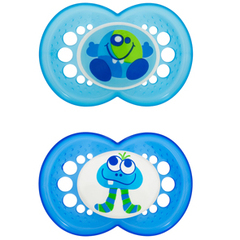 I love these pacifiers and when I got the opportunity recently to try some new ones, I was really excited. You always have to have a few extras just in case one gets lost, flushed down the toilet, stuck up the dogs nose, etc..
Ummm, told you that they were the cutest! They are designed so that they are good for baby's jaw and for their skin! You know that nasty paci-mouth-rash? None here! This is the MAM Perfect! We hadn't got a chance to try this pacifier yet, but I am so glad that we received one! This is such a great pacifier! It is designed to reduce the risk of misaligned teeth, and it is extra thin and super soft. This is really a super cool pacifier, I really like the large ventilation holes, which helps to avoid that yucky paci rash! This is our new go-to paci, and I definitely recommend it to all mommies out there! We were also lucky enough to receive some great training cups for Bean! This is the awesome trainer cup that we received. 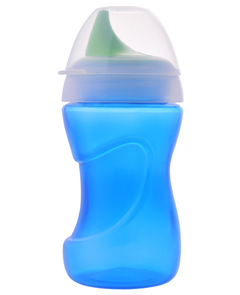 It is perfect for transitioning from the bottle or breast to a cup. I love the handles too, it really helps baby learn to hold their own cup!BPA free, of course, and and spill-free, which is awesome! This is a great beginner cup! We also received two of the Learn To Drink Cups from MAM! 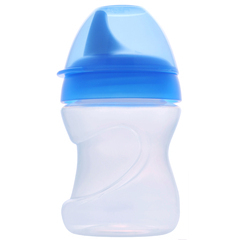 I love the hard spout, it really helps getting baby ready to drink from a glass. It also has this really cool innovative valve, that prevents leaking! Thank you so much to MAM for providing us with all these wonderful products! I am slowly working on getting rid of the pacifier, and switching to a big boy cup, but in the meantime, MAM will keep us happy! 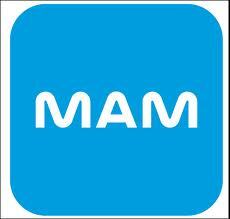 To check out MAM's extensive line of baby products, just click here! Where can I find the cups?! I tried using the Avent ones for my tiny (fat) man and they leaked SO bad they were awful, I just threw them away because i wasn't about to deal with that mess. I then tried the Nubby ones and he doesn't take to those, acts like it's going to kill him to drink out of it. I would like to try to MAN too but idk where i can find them. Our kroger doesn't carry them. Does walmart have them?